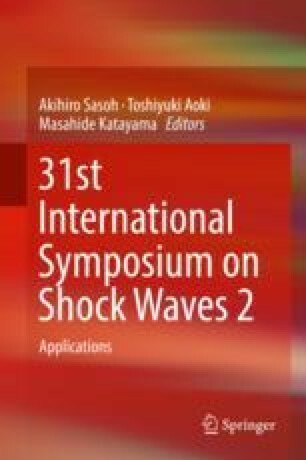 Shock waves are essentially nonlinear waves that propagate at supersonic speeds. Any sudden release of energy will result in the formation of shock waves. Personnel at the war fields are constantly exposed to shock waves generated by bombarding ammunition. The short-term and long-term effects of this exposure on various systems of the body are not clearly understood. In this study, we have shown for the first time that shock wave exposure confers protective immunity in a murine model. We have tested this with Salmonella typhimurium in Balb/c mice. War field conditions were mimicked in the laboratory using the diaphragmless shock tube. Infection challenges post shock wave exposure were evaluated by checking the organ load of Salmonella in the spleen, liver, and mesenteric lymph nodes. It was found that the bacterial load in these organs was significantly lower as compared to the control group of animals. The mechanism of this phenomenon was also addressed by measuring the cytokine levels in serum of the animals. It was observed that the proinflammatory cytokine expression is enhanced after exposure to shock waves. In a nutshell, we show that shock waves can induce protective immunity against infections by altering the levels of proinflammatory cytokines.